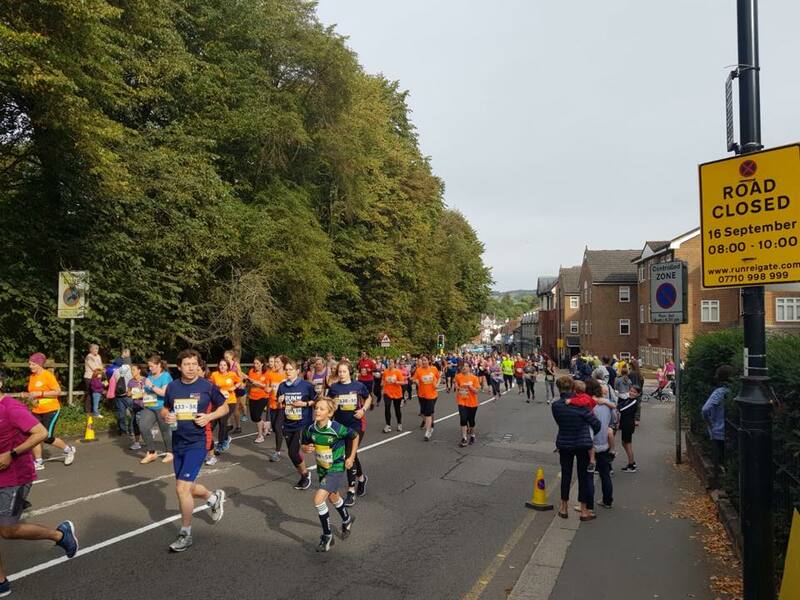 On Sunday 16th September the sun was shining bright for the nearly 5,000 runners and thousands more watching, at this year’s Run Reigate. 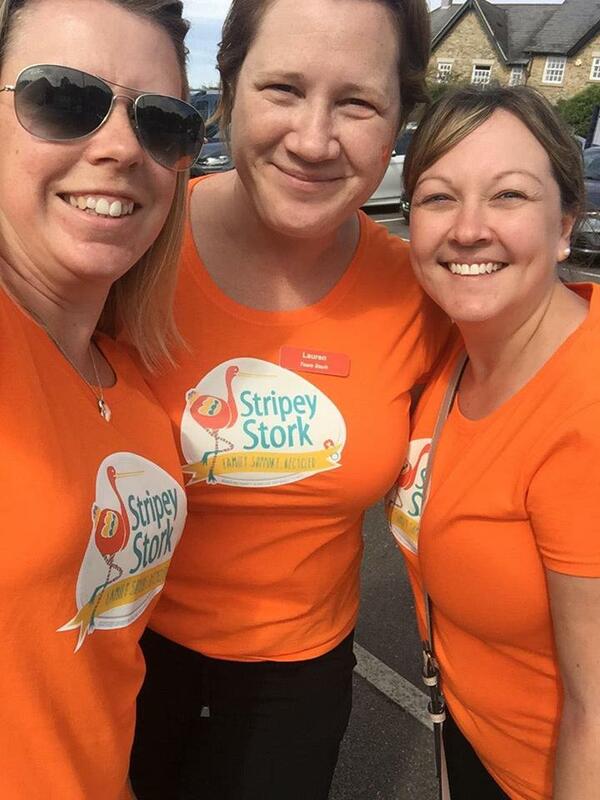 And we did it again – Stripey Stork joined in with this huge community event and had a blast. We’d like to thank the Run Series team for choosing us to be the lead charity partner this year, and also for the added privilege of debuting their 5k race in celebration of our joint 5th birthdays. 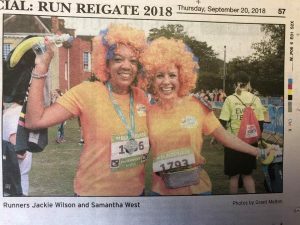 It was our best Run Reigate yet, with our amazing fundraising efforts coming in at over £13,000, which includes our runners’ sponsorship, collections on the day, as well as Run Reigate’s £5 contribution from the race fee of every 5k runner. We had a whopping 86 runners on Team Stork this year. That’s 86 adults and children who gave up their time and energy for Stripey Stork. Some would have been running anyway, some were motivated to run because of our local cause. Whatever the reason, we thank you very much and give you a big pat on the back. We’d especially like to thank some of our most loyal brand advocates who always get behind our cause. 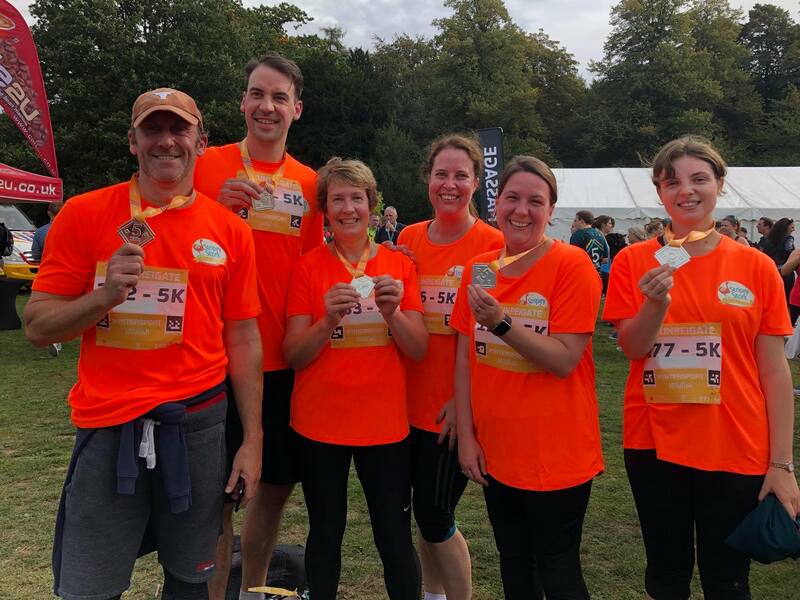 Our good friends at Grant Thornton International who not only support us with great events like Run Reigate, but are regular volunteers and a good sounding board with their impressive skill set. Special shout-outs also go to Jess from Caterham WI, Jessica from Bailhache Linton and Jon from Celtic Contractors, you ran your socks off for us on the day, with a smile and a spring in your motivated step. The partnerships we have with this great bunch of people are mutually admirable and we want them to know how much we appreciate their dedication to our cause. 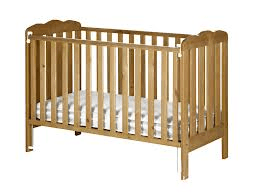 Rest assured, all money raised will be put to good use in helping us reach more vulnerable, local families in desperate need, by passing on your preloved children’s items quickly and complementing them with new essential items. Half marathon runners – Thank you Ugur, Karin, Sathish, Jessica, Jon, Matthew, Marie-Therese, Aimée, Chris, Beth and Hector. 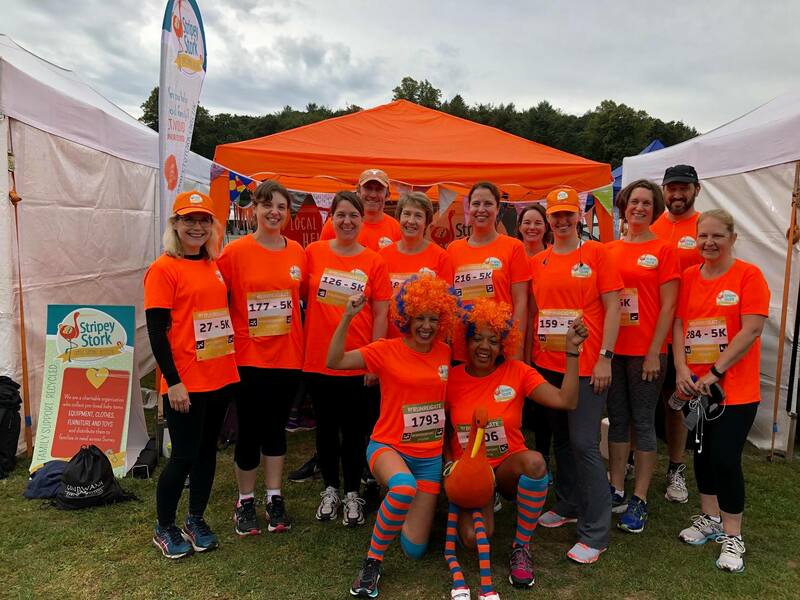 10k runners – Thank you Alison, Des, Liz, Jackie, Sam, Sonja, Alison, Lisa, Laura, Jo, Robin and Claire. 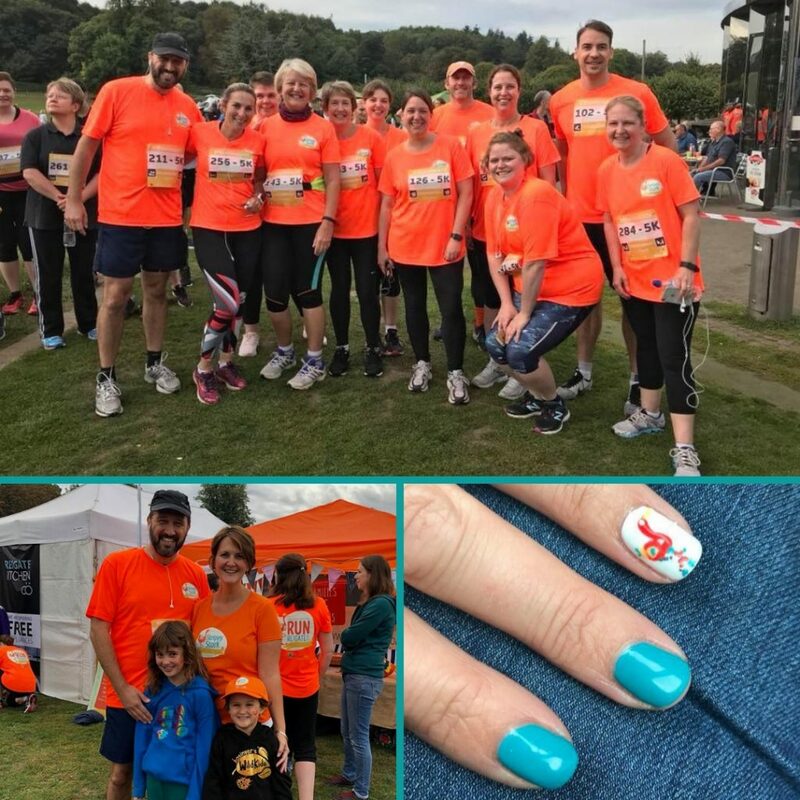 5k runner – Thank you Abigail, Caroline Richardson, Caroline Stanghon, Donna Pariser, Sonya, Genia, Jess, Victoria, Paul, Eleanor, Stuart, Donna Palmer, Donna Frost, Liz, Charley, Roz, Lynn, Rosalind, Marie, Paul, Simon, Rebecca, Sarah Cape and Sarah Williams. Kids race – Thank you Beatrice, Evan, Ruth, Scarlett, Isabella Brown, Liam, Dylan Burns, Hamish, Olivia Bhagwanbali, Lucas, Oliver, Olivia Woodrow, Bella, Dylan, Kai, Isabella Cape, Charlotte, Holly, Tilly, Harry, Lexi, Joshua, Matthew, Sophie Pariser, Joseph, Jack, Emilia, Sophie Dawes, Imogen, Nell, Cormac, Caitlyn, Elizabeth, Theo and Finlay. Fundraisers – Thank you to those who raised funds but were unable to run on the day – Melissa, Charlotte, Andreaa, Veronice and Chris. 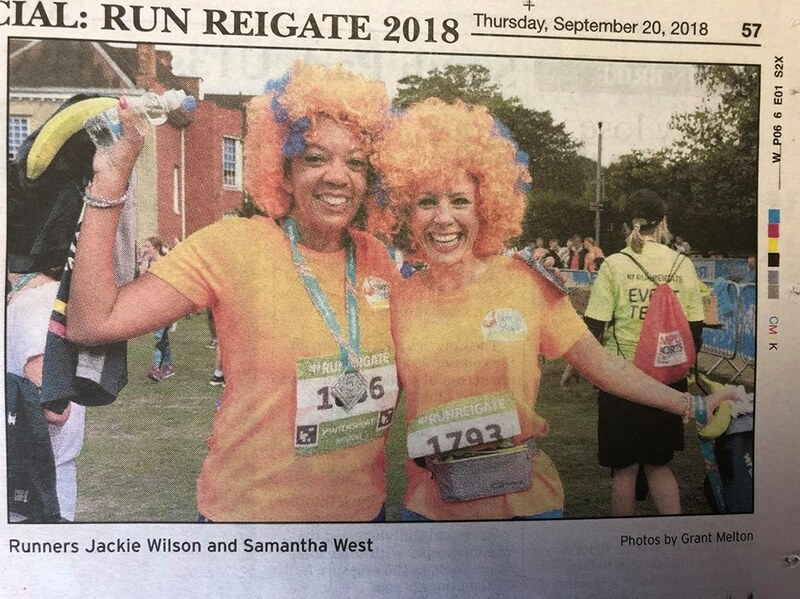 Our runners even caught the attention of the Surrey Mirror, not that they could really miss them! #RunStripeyRun Competition – Helped by a generous contribution from Grant Thornton International, we were able to set up a branded winner’s podium and backdrop. For this event we decided to use it for a social media photo competition to win a £250 Amazon voucher. Our prime spot near the finish line meant that people had lots of fun posing with their team, family and friends. We were so happy when our winner, who was selected at random, happened to be one of our runners and one that you just couldn’t miss. Sam West, here with her friend Jackie Wilson, was happy to say the least! For all competition photo entries, see bottom of page. 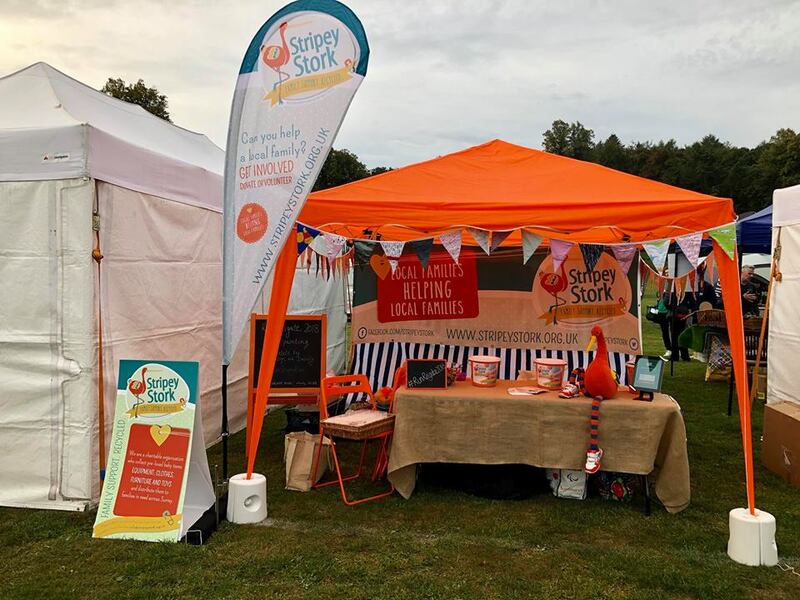 Stripey’s Stall – We had our bright, some may say glowing, orange gazebo in the Events Village. 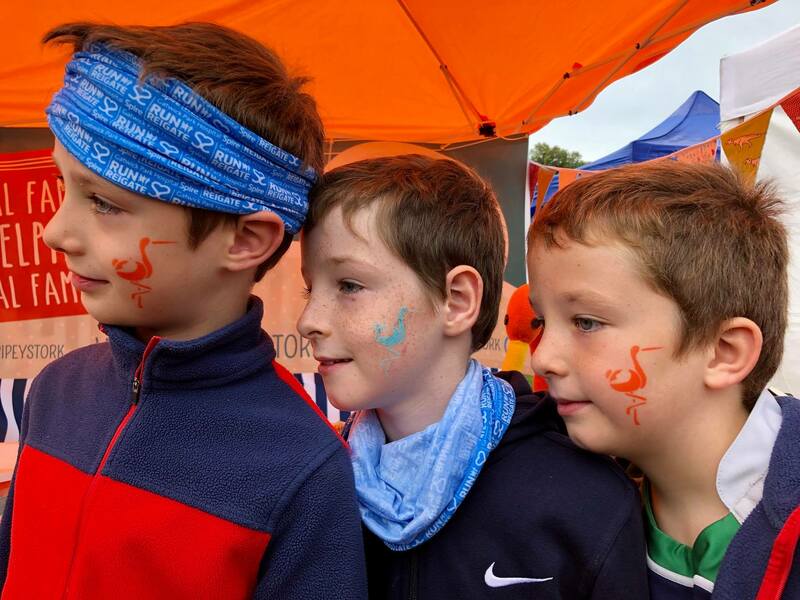 New for this year was our Stripey Stork face paint stencil by Ideal Stencils. It was super cute, super easy and it meant that everyone who wanted one could because they were super quick – you’ll be seeing these again too. The only issue was blue or orange? We also had our little stork Caitlyn, stealing the show in her famous stork costume. 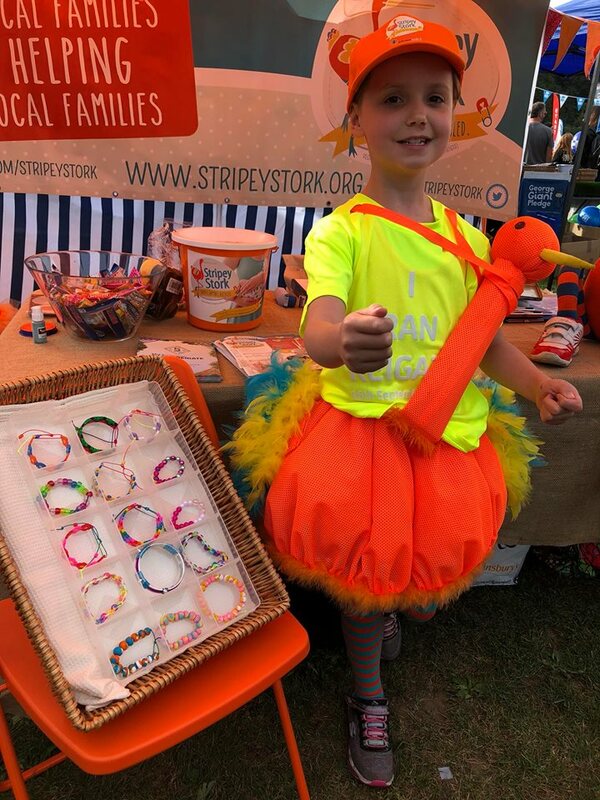 Her and her friend had also been busy making bracelets to sell on the day at 50p each – so pretty and every penny going to Stripey Stork. Massage Tent – Our volunteers were busy collecting suggested £5 donations per massage, and coordinating the queue of runners. It was a great opportunity to chat about what we do and the families we help. I have a feeling there’s going to be some empty lofts and garages as a result. Thank you Serenity Massage Therapy, Revolutionary Retreat, Peter Hudson, Zuzana Young, Redhill and Reigate Surrey Tissue Therapy, and Julie Simcock for donating your time and skills on the day. 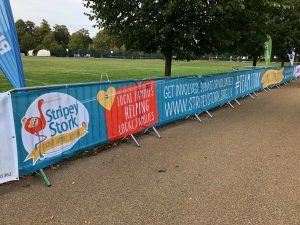 Car Parks – We were allocated two car parks to manage on the day and collect £3 suggested donations, which is another great fundraising opportunity for us. Little did we know that the evening before we’d be allocated a bonus car park, giving us 350 parking spaces in total. Our dedicated team of volunteers stepped in and covered the additional load, where buckets were shaken and filled. Thank you to everyone who paid to park in one of our spaces. 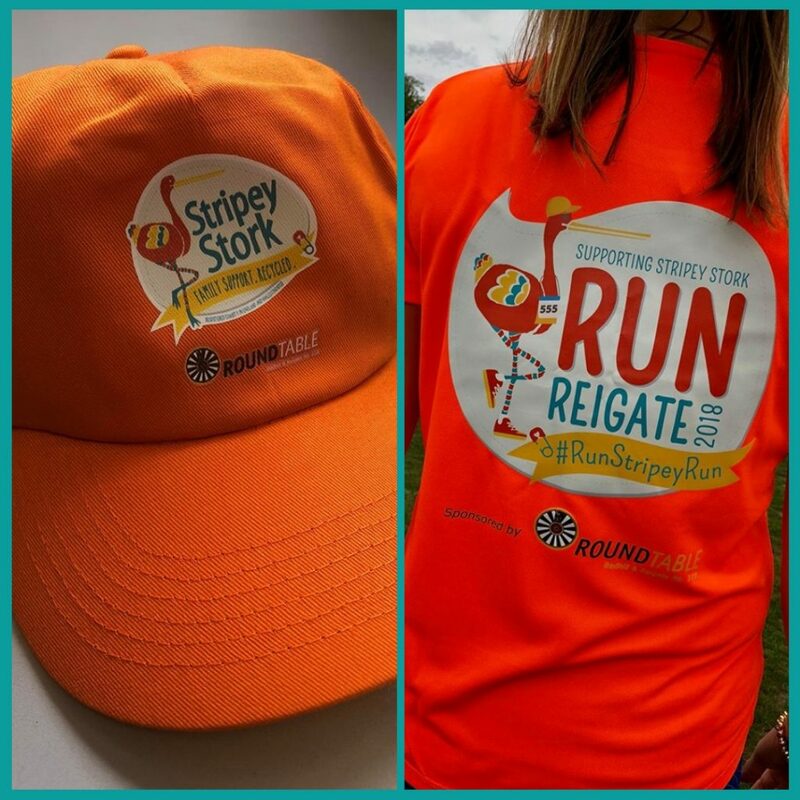 Each Team Stork runner had a Stripey Stork goody bag waiting for them on our stall to collect after the race. 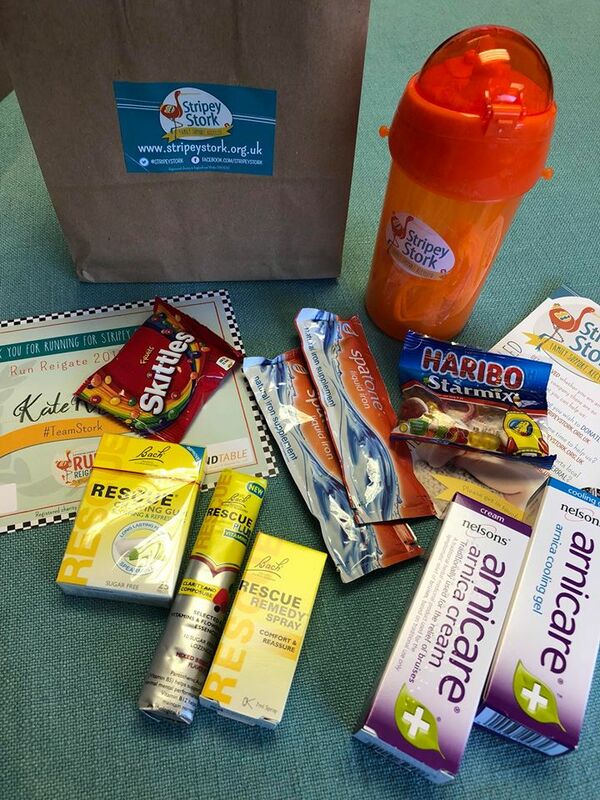 A big thanks to Nelsons for supplying the healthcare remedies to complement our treats. They were very well received – some saying it was the most useful and thought-out race reward they had ever received. In each bag was also a personalised certificate from Stripey, each name beautifully calligraphed by Sam Chapman – thank you Sam! Lauren (special thanks for organising our army), Ann, Ben, Caitlyn, Charlotte, Donna, Emily, Emma, Graham, Jenny, Jill, Jo, Lisa Caley, Lisa Tye, Louise, Marie, Megan, Melanie, Nicola Bailhache, Nicola Dawes, Pat, Roz, Sara, Sarah Cape, Sarah Sproston and Susy. 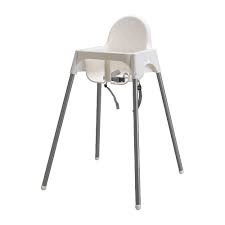 Redhill & Reigate Round Table No. 119 – A big thank you for your generosity in sponsoring this year’s kit. The kid’s orange baseball caps and adult’s running T-shirts were visible from all over Priory Park, which was exactly our intention – mission accomplished! www.rt119.org.uk. Morrisons Solicitors – Thank you for kindly giving us some complimentary wrist bands for your Rest & Relaxation Zone. We gave the passes to our top four fundraisers to enjoy with their plus one. What a treat! www.morrlaw.com. Crumbs Brewery – Thank you for quenching the thirst of so many runners. 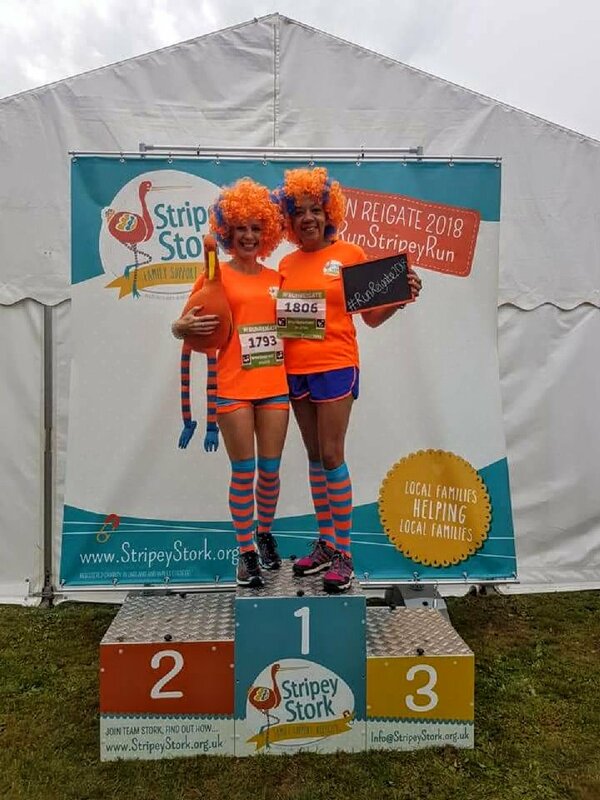 For each runner who flashed their medal, you gave them the option of discounting £1 off their beer or donating to Stripey Stork. 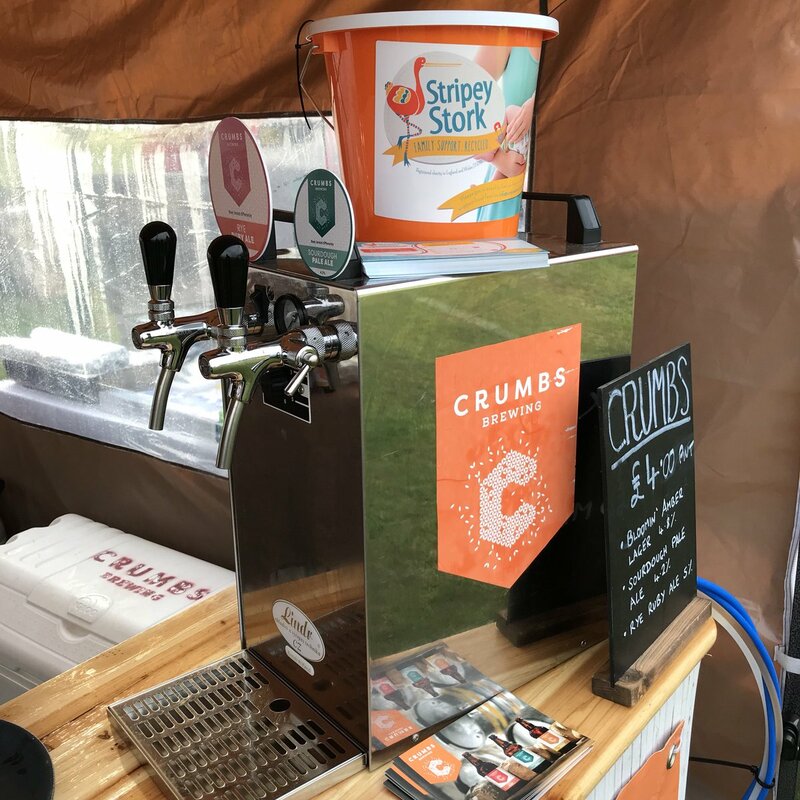 www.crumbsbrewing.co.uk. 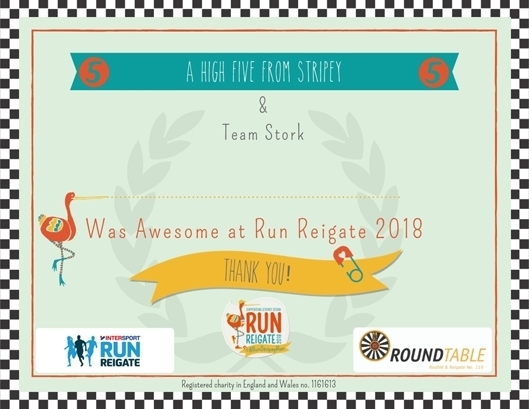 All Things Chic – Thank you for donating £5 to Stripey Stork for each customer who took part in Run Reigate. 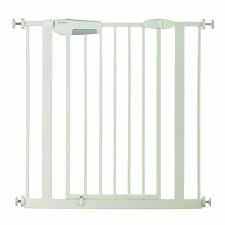 www.allthingschic.org.uk. 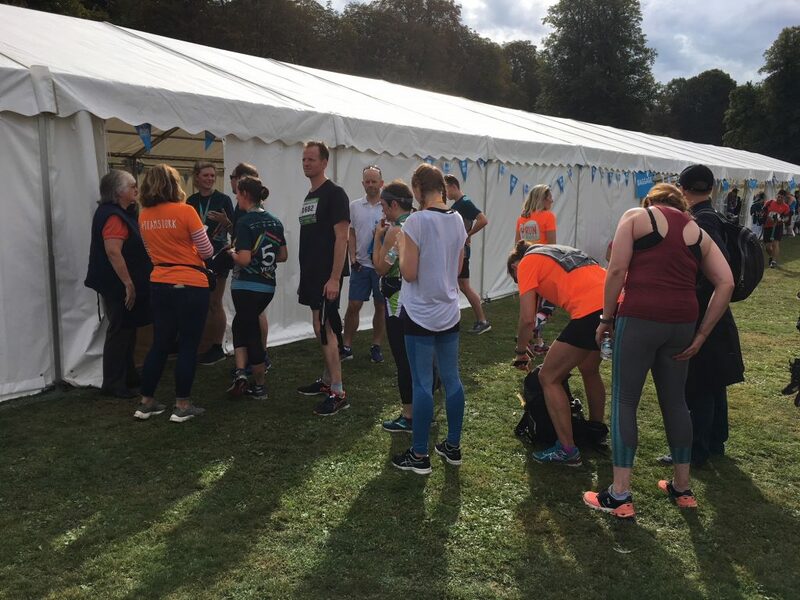 We see that plans for Run Reigate 2019 are already underway. We hope to work with this fab team again next year – special thanks to Lisa, Karen, Jodie and Dave for all your support and hard work! We loved every minute of it and feel our collaboration goes from strength to strength, Team Stork forever!